Over time, RA causes inflammation and displacement at the MP joints along with possible rupture of the tendons that cross these joints. Ulnar-sided “windswept” fingers, spongy feeling knuckles, inflammation of the metacarpophalangeal (MP) joints, and pain that becomes more intense over time are hallmarks of Ulnar Deviation, also called Ulnar Drift. Orthotic intervention designed to stabilize and protect the joints and soft tissue has been shown to improve hand strength and function. Though splints have not been found to prevent deformity, it has been demonstrated that splinting may help maintain range of motion, reduce morning stiffness and relieve deforming stress on the digits. 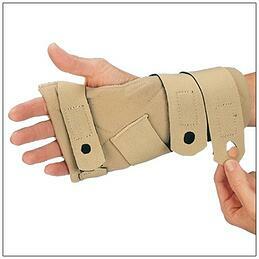 Consider providing orthoses from the outset of the diagnosis especially at night to protect the fingers and wrist. For nighttime, the Comforter Splint maintains the wrist and MP joints in a neutral position while leaving the small joints of the fingers and thumbs free for function. By preventing individuals from keeping their hands in a flexed posture during sleep, the Comforter Splint reduces stress on the hand and wrist and helps reduce morning stiffness. Fitting an orthosis at the earliest signs of MP effusion or ulnar drift serves to support the joints and supports efforts at joint protection techniques. The Polycentric Hinged Ulnar Deviation Splint was designed specifically as a daytime splint for those with ulnar deviation at the MP joints. 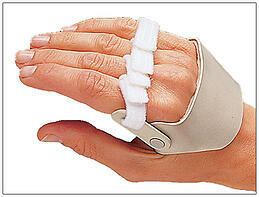 The splint maintains the fingers in straight alignment and allows full motion at each joint. 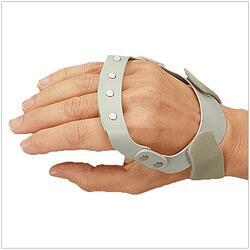 The hinges ensure free MP motion and the palm is left open for function. In cases where deviation has progressed and ligamentous shortening makes it difficult to passively correct the deviation, the Radial Hinged Ulnar Deviation Splint provides a stronger pull at the MP joints to bring them into, or close to, neutral alignment. The combination of a hand based splint for function during the day and a protective splint at night is a prescription for improved function, greater comfort and independence for your patients. This blog is presented for informational purposes for healthcare professionals. We will gladly answer questions pertaining to products, however, we are unable to provide specific patient diagnoses or treatment recommendations.